For those of you who, like myself, missed out on Quilt Con last year (or for those lucky enough to attend, but who would like to reminisce) Craftsy allows you to view the lectures without paying. You can also enroll in Block of the Month Courses for 2012, 2013, and 2014 for free. Craftsy offers eight free quilting classes including Piece, Patch, Quilt: Basic Quiltmaking Skills, Pictures to Pixel Quilts, and Creative Quilt Backs. While many quilters sale patterns on Craftsy, there are a ton of free patterns too. I appreciate that my courses are perpetually available, so that I can learn from the pros whenever and wherever it suits me. In the event of an interruption, Jacquie Gering and Angela Walters will wait for me, even if I return a month later. Just like in real life, I can ask the teacher questions, see other students' work, take notes, and get a packet of course materials. Unlike real life, I won't be chastised for being in my jammies the whole time, requesting a snack break, and having the teacher show me my favorite technique over and over again. 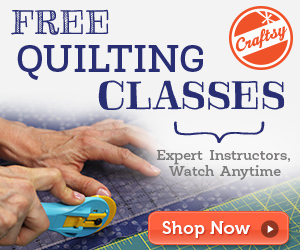 You can find a course on most any topic, not just quilting. There's photography, cooking, sewing, knitting, cake decorating... The list goes on and on; but if you're after modern quilting instruction, they've got the entire process covered, from designing to free motion quilting. I've taken several courses, and found the content to be very useful. Most recently, I've taken Angela Walter's Machine Quilting Negative Space. It's been very encouraging, and has pushed me to broaden my comfort zone. Without further ado, let's see about giving away a class. Click the link below. The drawing will close April 1. Craftsy will contact the lucky winner via e-mail. Good luck! Disclaimer: You'll need to sign-up for a Craftsy account to qualify. Also, I'm an affiliate, so I'll be mildly compensated if I convince you to develop a Craftsy fetish of your own. However, if I didn't love Craftsy, I wouldn't recommend them. Those QuiltCon lectures from last year were great! I watched them a while back, but I was so inspired. *Fingers crossed* the stars align and I can attend in 2015. Are you planning to go, Afton?